Balancing management regulations with the needs of the fishing industry. 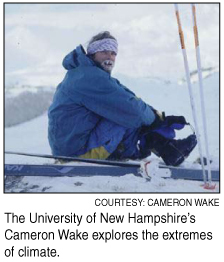 Over the past two decades, Cameron Wake has drilled ice cores in Kyrgyzstan, Nepal, China, Pakistan, Greenland, Antarctica and the Canadian Arctic in the name of climate science. As a research associate professor at the University of New Hampshire, his work still leads him to plenty of far-flung places. Some of his recent projects, however, are happening closer to home. Wake is investigating changes in New England’s climate and air quality as part of the National Oceanic & Atmospheric Administration’s AIRMAP Mapping New England’s Changing Climate and Air Quality program. He’s also teamed up with other researchers and the Union of Concerned Scientists to participate in the Northeast Climate Impacts Assessment, an effort to develop and communicate a new assessment of climate change, impacts on climate-sensitive sectors and solutions in the northeastern United States. The team issued its first report about a year ago-and the results weren’t exactly rosy. Wake spoke to The Gulf of Maine Times about the assessment and what it means for residents of the Northeast. Q: How did the Northeast Climate Impacts Assessment study the impacts of climate change? A: We looked at two different scenarios: a scenario of high emissions of heat-trapping gases, and a low-emissions scenario. Our predictions depend fundamentally on which emissions scenario we choose. The future climate is literally in our collective hands, depending on the choices we make about our emissions of heat-trapping gases. Q: What do you predict for the Northeast if we continue under our current high-emissions scenario? A: In the high-emissions scenario, the average temperature in the Northeast will be 8 to 12 degrees warmer by the end of the century. The number of days above 90 degrees Fahrenheit (32 degrees Celsius) will increase from the current 10 to approximately 60 to 70 across the Northeast. More than two-thirds of the summer would essentially be a heat wave. By the end of the century, both the amount of snow cover and the number of snowy days would be reduced by more than half. We would expect that New England would experience a short-term drought, one to three months long, every summer. We would expect the loss of the commercial cod fishery from much of the Gulf of Maine. Under the high-emissions scenario, we’d have a climate that is essentially unrecognizable to us. We’d lose all characteristics of the seasons. That’s if we continue to rely primarily on fossil fuels as our primary source of energy. Q: We hear a lot about sea level rise. Is this affecting us already? A: Sea levels have risen by about 15 to 17 inches (38 to 43 centimeters) over the past 150 years. The sea level has gone up because the sea surface is getting warmer. Warmer water is less dense, and less dense water takes up more volume. We also know the coast of New England is sinking two to three millimeters (about one-tenth of an inch) a year due to natural movements of the Earth’s crust. That makes us particularly vulnerable. We’ve seen the effect of sea level rise already. You don’t see a lot of day-to-day changes. We really experience it when we have something like the Patriots’ Day nor’easter that hit in April of 2007. We were at astronomical high tide when it hit. That caused substantial coastal erosion. In Saco, Maine, and in Nantucket, Massachusetts, there were houses that effectively fell into the ocean. Q: What can we expect from the rising sea level? A: There’s actually a lot of uncertainty with respect to how much sea levels are going to rise. They will rise, because the surface of the ocean is going to warm up. Conservative estimates say the sea level will rise one to three feet (30 to 91 centimeters), just from the ocean warming up. That does not include the significant melting of the ice sheets. The Greenland ice sheet is beginning to behave differently. The loss of glaciers has doubled in the last decade. If that continues, we’re looking at a sea level rise somewhere on the order of 20 feet (60 centimeters). There’s considerable uncertainty in terms of whether or not that is going to happen. That uncertainty should be a cause for concern. We’re going to have to learn how to adapt to the sea level rise and coastal erosion. That will require both building new infrastructure and abandoning some [coastal] locations. Places like the Rachel Carson National Wildlife Refuge in southern Maine are at risk of being drowned by rising sea levels. There will likely be significant impacts on coastal ecosystems as well as coastal communities. Q: Can we prevent disaster if we start on a low-emissions path? A: The impacts would be substantially reduced. Under the low-emissions scenario, we’d retain some of the character of New England’s climate. We’d retain the seasons. We’d continue to have winters with snow. Our summers will still be warmer, but they wouldn’t be unbearable. We’d still have wonderful fall foliage and springs with maple syrup production. What is at stake is the character of New England’s climate. We also want to do everything we can to reduce emissions to ensure that something like the melting of the Greenland ice sheet does not happen. The changes that we would incur would be so tremendous and catastrophic, it would change society as we know it today. Q: How can individuals make a difference? A: My first recommendation is to figure out what your carbon footprint is. [Visit the Environmental Protection Agency Web site to access a personal emissions calculator.] It’s very much like doing a family budget. Once you know what you’re emitting, sit down with your family and come up with a strategy that’s going to help you reduce your emissions but maintain your quality of life. Also, it’s about us acting as citizens. We cannot elect another official at any level of government-municipal, state or federal-that does not have a specific plan about how to reduce emissions of heat-trapping gases, and a plan for how they’re going to pay for it. Q: What about the argument that lowering emissions will be damaging to our economy? A: I’d point to the Stern Review on the Economics of Climate Change [a report released in 2006 by economist Nicholas Stern for the British government]. It shows it will cost 1 percent to 2 percent of the global gross domestic product to reduce emissions now. Not addressing the issue now, and responding to the climate change if we continue emitting carbon at the current rate, will cost 20 percent to 25 percent of the gross domestic product [down the road]. So there’s a short-term investment for a long-term gain. It is going to cost, but there is a much greater cost of not acting. Q: Are you optimistic that we can get on the right path? A: I am optimistic that our next president will lead us in the right direction, because I think our next president will have very little choice. The future climate that our children and grandchildren will inherit depends fundamentally on the decisions we make today, and over the next decade, about our emissions of heat-trapping gases. Addressing global warming is going to take an enormous amount of effort, but if we act swiftly, we can turn a challenge into an opportunity. Kirsten Weir is a free-lance writer in Saco, Maine, who focuses on science, health and the environment. The full report of the Northeast Climate Impacts Assessment is available at http://www.climatechoices.org.